Major League Baseball claims it hasn’t had a game fixed by gamblers since 1919. Point shaving hasn’t admittedly occurred in the NBA since 1954. And the NFL publicly states not one of its games has come under outside influence–ever. This league-sponsored history, however, is wrong. When sports and gambling are mixed, they create a volatile cocktail of corruption, greed, and the very real potential for game fixing. 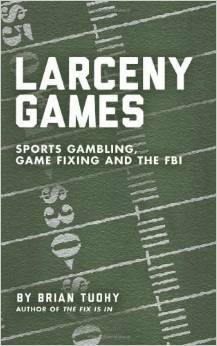 Larceny Games provides the details and names the names of Hall of Fame athletes who have either bet upon their own sport or outright thrown games for the benefit of gamblers–and why the sports leagues have covered-up these incidents. Often seen as a victimless crime, sports gambling is more than betting $50 on your favorite team; it’s a multi-billion dollar, illegal and mob-controlled industry. Larceny Games digs into this vast underworld through interviews with sports gambling insiders and former FBI agents as well as detailing information from more than 400 previously unreleased FBI case files relating to sports bribery (the legal term for game fixing and/or point shaving) to reveal how professional athletes and referees have been corrupted into fixing games in the NFL, NBA, MLB, boxing, soccer, and tennis. This is Brian Tuohy’s second book on game fixing.